I ask this question in both the lofty, high brow way we often associate with fine art and in the practical everyday use of the term. First, let’s address the practical. What is art and what isn’t? 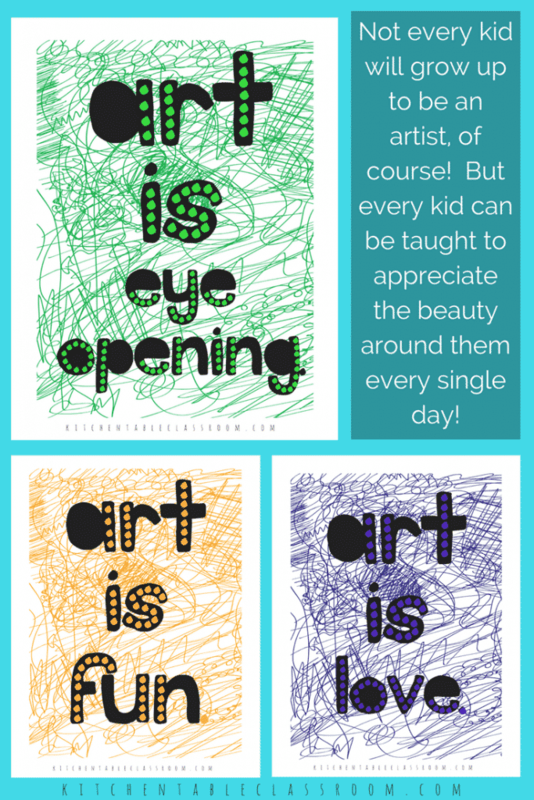 Art isn’t reserved for “Art Class.” Kids naturally want to create. Allow kids time and materials to create things that are meaningful to them. Don’t worry if your little people’s art isn’t pretty colors or look like what it is “supposed to.” Allow for experimenting, for leaving the beaten track, or the list of directions. Sometimes art is pretty and sometimes it’s not, and both are acceptable. But, if it’s done right, it is always meaningful to the artist. I‘m a homeschool mama so having any given “class” at home is nothing new for us. No matter where your kids are educated I urge you to allow them space to make at home. Fancy art classes are great if time and budget allow but they are so not necessary to grow an artist. If your child (or you) needs starting point for at home art I urge you to checkout my e-book Artists and the Elements. 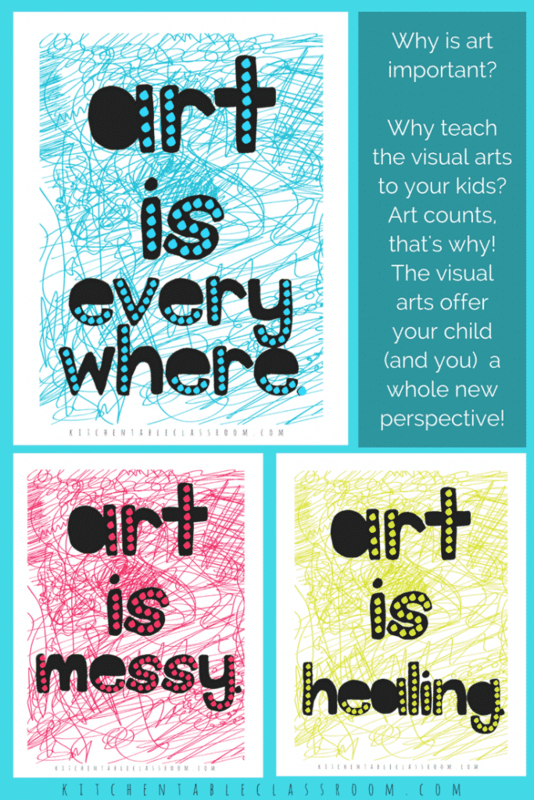 It’s a year long art curriculum that provides everything you need to encourage your kiddo along their artistic journey. Let there be no cookie cutter art projects! Art experiences don’t have to be expensive. In fact, many of my favorite kids art materials cost less than a cup of coffee and can last for seasons. Art can be made from the recycle bin or with ingredients from the pantry. In fact not having all the perfect supplies at hand will induce some awesome problem solving in your little artists. Get out of the way, allow a little mess, and you’ll be amazed at what they can make out of almost nothing! Learning to think outside the box is a huge benefit of the arts! I have this one kid, he’s soooo logical. He’s a copycat of his engineering Daddy, all right brained and ruler loving. Messy hands and open ended directions literally stress him out. Is he going to be an artist? Chances are, probably not, at least not in any traditional sense. Does that mean visual arts don’t serve a purpose in his life? No sireee. Teaching kids to appreciate art , whether in an art museum or in nature is totally worth it. Seeing beauty all around makes life a little sweeter and who doesn’t want that? And just because your kiddo doesn’t want to grow up to be a painter doesn’t mean they might not be an amazing architect, or graphic designer, or an engineer. Aesthetics are important in many careers, not just fine artists. 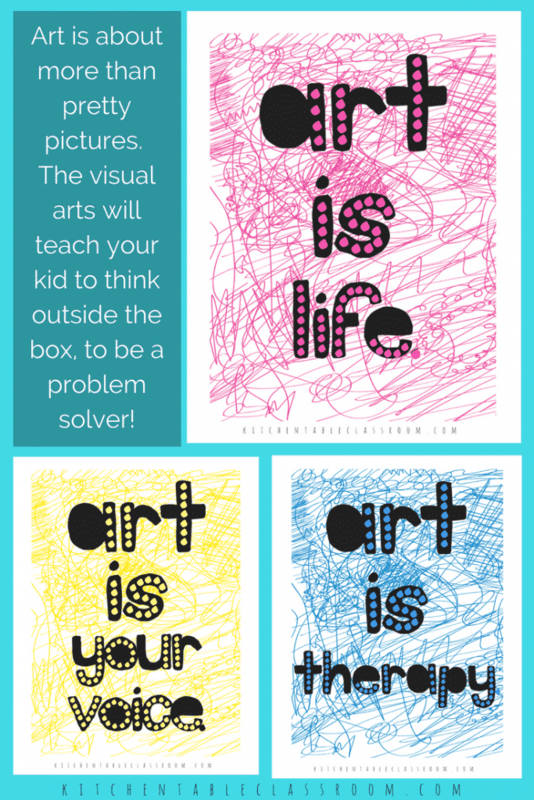 Do you love these “what is art” quotes and want to grab the printable PDF version? Use the turquoise subscriber form below to become a subscriber to my weekly newsletter. You’ll get some creativity in your inbox plus instant access to my Free Resource Library. Upon confirming your subscription you’ll get a subscriber only password to my Resource Library. 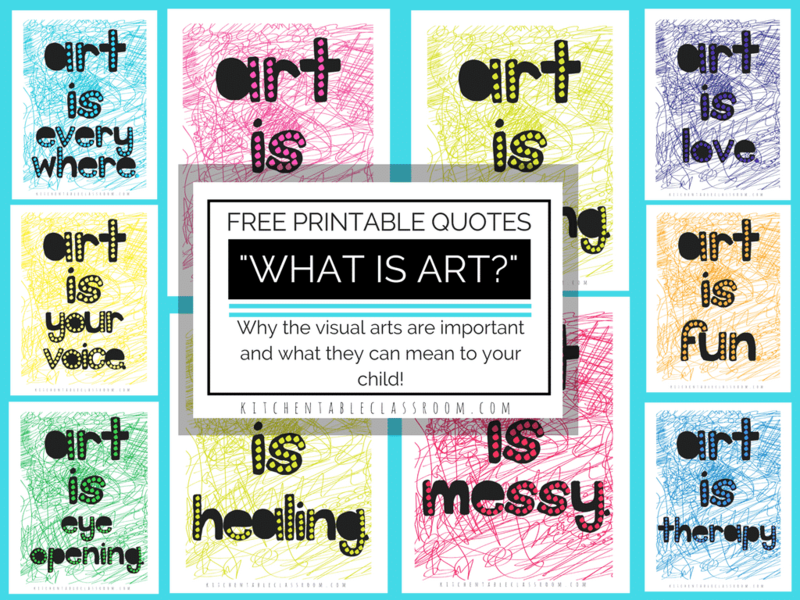 These set of free printable “what is art” quotes will be there in easy to print PDF form along with dozens of other printable quotes and art resources!